Ever dreamt about owning your own Micro Brewery but felt you didn’t have the time or money to invest in one? Ever wished you had beer on tap in your own house or just simply want to impress some friends? Well look no further, because all of this can be achieved with just a small outlay, a bit of patience and very little effort! A few months ago, I decided to invest in a home brewing kit and I must say it is brilliant. 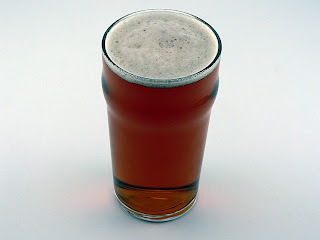 Not only is it great fun and extremely interesting, you can produce large amounts of top quality beer and/or cider that is incredibly cheap and easy to make all within your own home! There are a number of home brewing shops dotted around the UK all selling top of the line kits ranging from starter packs to mashing equipment and oak barrels. 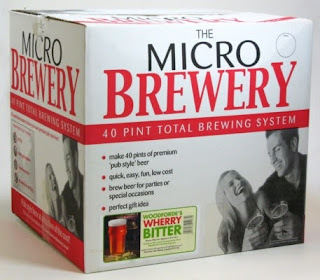 Being a total amateur when it comes to brewing, I opted for a Micro Brewery Starter Kit from my local store (pictured). In this I got: a 5 gallon (yes, 5 GALLON) fermenting bin, pressure barrel with CO2 injection capabilities (oh yeh), large stirring spoon, hydrometer and trial jar, siphon tube, sterilliser and an air lock. On top of this it included full instructions and all the ingredients to make the excellent ‘Woodforde’s Wherry Bitter’! All of this for just £65.85! The process itself couldn't be easier, you simply mix the ingredients together in boiling water, fill up with cool water, leave for 1-2 weeks, siphon into the barrel, add sugar, pressurise it and leave for 3-4 weeks. So in theory, in 4-5 weeks you can have a whole 40 pints ready to drink! And yes, dressing up as a witch whilst stirring your bubbling brew is optional. Of course not many people are going to be getting through 40 pints in one weekend, so all brewing shops will sell a range of bottles for storage, allowing you to keep the beer as long as you wish (but regular plastic drinks bottles will do the trick). There should also be a selection of brewing ingredients so that you can put your own personal touches on your brew; this is however easier said than done! It has to be said, not everything you produce is going to be winning awards, and there is a certain aspect of trial and error. However, with some attention, careful planning and the right storage you can make a really tasty beverage that is going to last you a while and save you a fortune in the long run if you buy beer regularly from the supermarkets. And probably most importantly of all, you have a bloody good time doing it! So I implore you, give it a go and become the brewer you were born to be! Have you ever tried out a home brew kit? Did you dress up as a witch too? Did you explode your house? Let us know in the comments!